The Sound Card connection consists of two 3.5mm jacks. One jack is for the microphone and the other the speaker. When a headset is plugged into the Sound Card it takes over the sound that would normally come out your speakers. The Chameleon Monaural Headset� 2001 is engineered and manufactured for maximum comfort, resilience, durability, unsurpassed sound clarity and noise-canceling. 1163 - Consumer Grade Analog PC Soundcard Patch Cord with Volume Control. The Chameleon Duo Headset� 2002 is engineered and manufactured for maximum comfort, resilience, durability, unsurpassed sound clarity and noise-canceling. 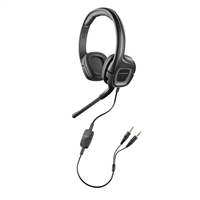 The Plantronics� .Audio� 326 delivers full-range stereo, Internet calling, and comfort. An adjustable boom brings the microphone close to your mouth for conversation and stows conveniently when listening to music, Podcasts, or DVDs. Noise-canceling features reduce background noise for callers. Pillow-soft ear cushions focus sound for hours of comfortable listening. Watch video, listen to music, or stream in a Podcast in full-range stereo. Convenient in-line controls let you adjust music volume and microphone volume, or mute the microphone with just a touch. An adjustable boom lets you bring the microphone close for conversation. Rotate it out of the way when listening to music or watching DVDs. 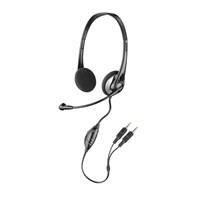 For quality and versatility, choose the Plantronics� .Audio� 355 multimedia headset. Forty-millimeter speakers deliver studio-quality audio with maximum bass response�so music, DVDs, and games are even more enjoyable. Outstanding voice quality, precise microphone placement, and noise-canceling features ensure that Internet callers hear you clearly. And games never sounded better. 40mm stereo speakers deliver rich, resonant stereo with maximum bass response. Don't just hear it�feel it. The QuickAdjust� microphone telescopes and rotates for precise placement. When not in use, it rotates discreetly out of the way. The noise-canceling microphone reduces background noise so you can easily be heard.